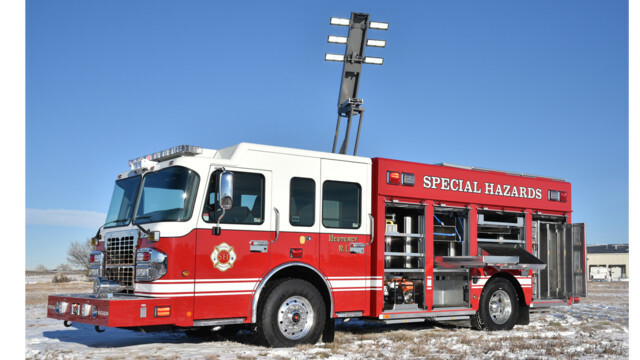 The Westerly, R.I. Fire Department recently took delivery of a special hazards heavy rescue built by SVI Trucks on a Spartan Motors cab and chassis. The cab has a 10-inch raised roof, a Cummins ISL 350-hp engine and an Allison 3000EVS transmission, Bostrom seats and a Kussmaul 1200 pump plus battery. Other features include an Onan 25,000-watt PTO generator, a Resolve Space Saver SCBA bottle fill station, Holmatro rescue tools. Hanney reels, a Command Light tower, On Scene Solutions compartment lights, R.O.M. roll-up doors, Whelen scene and warning lights and a Federal Q mechanical siren.